So there's a lot of discussion about the new Zelda game for the Wii U, and a lot of that is revolving around whether the Link we were shown in the E3 trailer is a guy or a girl. I'd just like to make a topic here that's focused specifically on that, rather than a general topic about Zelda U that already exists. It's hard to tell! This is easily the most androgynous Link we've ever had. So I had a bit of a thought. 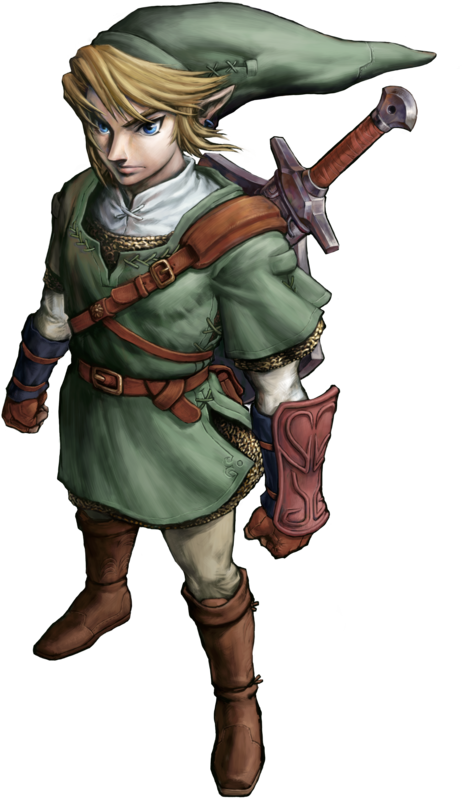 What if Nintendo, rather that having the player select Link's gender as many fans have suggested, simply made an androgynous Link and spent the entire game avoiding gender pronouns to describe them? We would still be debating whether Link is a guy or a girl even after the game's release, and that discussion alone may even generate enough buzz for them to get on the news, all without doing anything terribly controversial. What do you think? Link has never looked all that masuline, which is why females can pull off Link cosplays better than males. I'm sure this Link is a male like every other Link. I agree with GuSilverFlame. I'm sure gamers would have their fair share of issues with Link being gender neutral. I'm sure most in the US would still refer to Link as he. Personally, I don't care what they do with Link. They could make Link gay, straight, bisexual, transgender, male or female. I would still play them because it would still be a Legend of Zelda game. I'vE always felt Link was gender neutral from the start. Yeah, we say "he" all the time and his voice is clearly male, but aside from Skyward Sword and Wind Waker, I can't think of when Link's gender was actually a major plot point. Also, I don't get why people are confused. His cheesy is clearly very flat, and Nintendo actually avoids the stereotype of flat-chested women in Japanese media. I suppose you could argue he has a compression bra, but then you're really not convincing anyone. I don't see why this needs to be a debate. What if he/she is sexless (Like Nights). That would be interesting. Link has never been a body builder. While this is a bit more of a feminine Link, I still think he's a guy. And would you like to be the one that has to explain why hylians no longer have sexes? Because I wouldn't. I don't care if Link is a man or woman or neutral I honestly don't get all this controversy over something that is up to the creators of the series and will most likely not affect the core concept at all. That'd be the biggest Mind**** since that Tingle game. I wondered if Link might be androgynous after seeing the video for the first time, mainly because they seemed to have more feminine features than before. I have to admit that I'd really love to see Link be gender-neutral and it just not be an issue at all, which it wouldn't be if gender-neutral pronouns were used. Link is hardly ever referred to as "he" anyway, since the vast majority of interaction is with the player, so it wouldn't be much of a stretch for "Link" or "they"/"them" to be used in those rare instances. I really don't see how he wouldn't be male. I mean, gender choices would be pointless, since Link has been established as a boy in all legends about him. The gender most likely wouldn't make a gameplay-related difference, unless there was a relationship system and/or genderswapped Zelda, which wouldn't work either because Zelda is a girl's name, and changing the name defies the very title of the series. There's just no logical way to include Link as a girl without contradicting the series or even introduce new gender-based features without feminazis throwing a tantrum over said features. No, it won't happen. There's no reason to change its gender, and Eiji Aonuma does know this as well. Get over it, Link's still a boy. Anyone who thinks making Link genderless won't attract controversy is crazy. That could be potentially the most controversial thing. Not to mention it would just be creepy playing as an it. It's not natural and wouldn't feel right. You can tell Link is a girl by his girly pignus. I'm thinking he's male. Link has always looked like a girl anyways so no difference here. He wouldn't be an it; it'd just be up to the players to determine his gender. Link's always had feminine aspects, look at dem facial features.